Last November, IdeaWorksCompany estimated that U.S. airlines in 2018 would make approximately $15.6 billion in combined revenue from the sale of credit card points and from commissions from sales of partner products such as car rentals and travel insurance. Of that $15.6 billion, approximately $14 billion was expected to come from credit card points, Sorensen said. IdeaWorksCompany, the foremost consultancy on airline ancillary revenues, and CarTrawler, the leading technology platform providing full end to end transport solutions for online businesses, recently estimated airline a la carte revenue at $65 billion worldwide for 2018. The CarTrawler Global Statistics of a la Carte Revenue adds regional details and 2014 comparisons to the figures from the earlier November 2018 release. A la carte activity is a significant component of ancillary revenue and consists of the amenities consumers can add to their air travel experience. These include fees paid for checked baggage, assigned seats, buy-on-board meals, early boarding, and onboard entertainment. An annual study of “ancillary” revenue, which includes all income beyond the standard airfare, shows that the top 10 carriers worldwide raked in more than $29.7 billion (£23bn) in 2017, up from just $2.1bn (£1.6bn) in 2007. The CarTrawler Yearbook of Ancillary Revenue by IdeaWorksCompany analysed financial documents for 138 airlines. Unsurprisingly, Ryanair, and other low-cost carriers whose business models revolve around cheap fares and costly “optional” fees, feature prominently. IdeaWorksCompany, the foremost consultancy on airline ancillary revenue, and CarTrawler, the leading provider of online car rental distribution systems, project airline ancillary revenue will reach $92.9 billion worldwide in 2018. 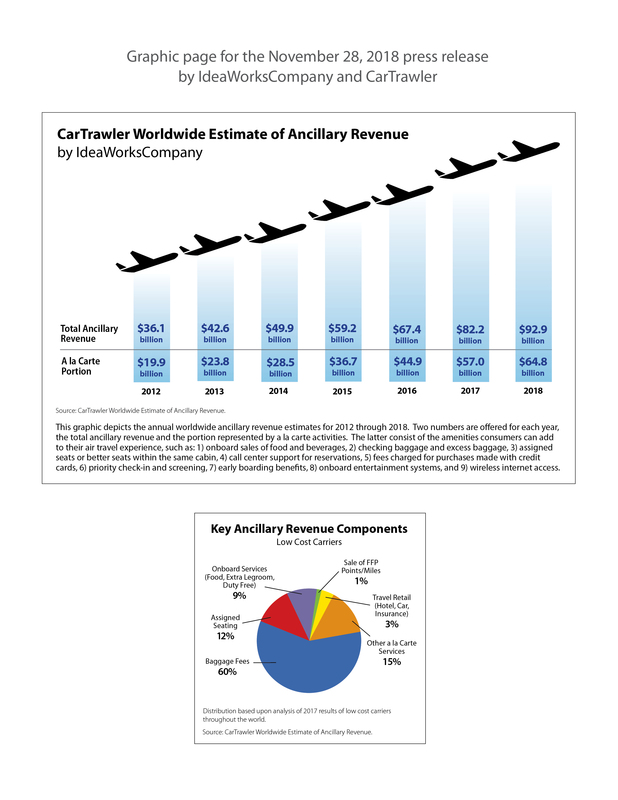 The CarTrawler Worldwide Estimate of Ancillary Revenue represents a 312% increase from the 2010 figure of $22.6 billion, which was the first annual ancillary revenue estimate. Earlier this year, CarTrawler and IdeaWorksCompany reported the ancillary revenue disclosed by 73 airlines for 2017. These statistics were applied to a larger list of 175 airlines to provide a truly global projection of ancillary revenue activity by the world’s airlines for 2018. Click here for 2018 Worldwide Estimate Infographic (JPG file). Ryanair already makes a huge amount of its capital from ancillary revenue, even before the new hand luggage rules came into play. In H1, this revenue stream increased by 27 per cent to €1.3bn (£1.1bn), driving an eight per cent increase in total revenue to €4.8bn (£4.2bn). This number is likely to only go up. It’s far from the only airline to make a consequential percentage of its profits through add-ons. EasyJet made $1.3bn (£1bn) in 2017 from ancillary revenue, 19.5 per cent of its total revenue, according to IdeaWorksCompany’s annual report, the Yearbook of Ancillary revenue. The airline was the 10th highest earner from this income source, revealed the report.